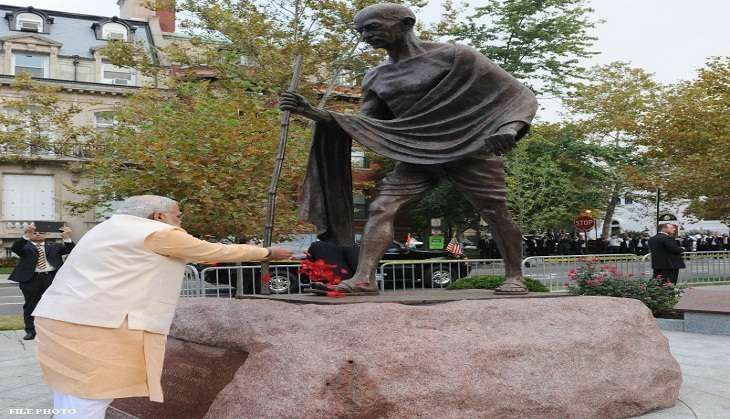 Prime Minister Narendra Modi on 2 October paid homage to the Father of the Nation, Mahatma Gandhi on his 147th birth anniversary today and said that his ideals, dedication to the poor and struggle against injustice were inspiring. President Pranab Mukherjee, Vice President Hamid Ansari, Prime Minister Modi and other dignitaries visited Rajghat, the Samadhi of Mahatma Gandhi to offer tributes. Former Prime Minister Dr Manmohan Singh, Union Minister M Venkaiah Naidu, Senior BJP leader L K Advani,Delhi Chief Minister Arvind Kejriwal, Congress leaderGhulam Nabi Azad also paid homage to the Father of the nation. An all religion prayer meeting was organised at Rajghat and a series of functions are being organised across the country to mark the day. President Pranab Mukherjee in his message said, "Gandhiji taught the value of harmonious co-existence and mutual respect and his ideals of non-violence, freedom, equality and religious tolerance have eternal value." He asked the people to imbibe wisdom from Gandhiji's thoughts and actions to address the challenges confronting the nation. He also urged the people to keep alive in their hearts and minds at all times the principles of tolerance and non-violence. Invoking Gandhiji's belief that cleanliness was next to godliness, the President called for concerted efforts to realize the dream of a Swachh and Samarth Bharat. The nation also remembers the former Prime Minister Lal Bahadur Shastri on his birth anniversary today. Born in 1904, he joined the Indian independence movement in the 1920s and held several important portfolios in the Jawaharlal Nehru's government including Railways and as Home Minister. Lal Bahadur Shastri led the country during the Indo-Pakistan War of 1965 and gave the slogan of "Jai Jawan Jai Kisan" which became very popular and is remembered even today. A special programme is also being held at the Shastri Memorial at Shastri Street in Tashkent where floral tributes will be paid at his statue.